Posada de Don Oli is a house with a classic Spanish colonial style, it has large common areas and parking space for several vehicles. The whole decoration of it, was inspired by the traditional craftsmanship of the region. The hotel has 5 comfortable rooms, 2 with double beds, and 3 double rooms with a capacity of 4-5 guests. The hotel offer a transfer services from and to the airport, and also hotels in any part of the country. Tours to waterfalls, canopi, lake trips, visit to El Carmen Coffee Shop, and coffee tours are available. 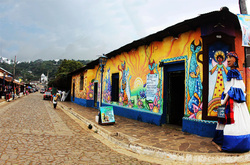 Ataco is one of the most popular places in the Ruta Las Flores Tour. The colonial city is surrounded by a pleasant cool weather amidst coffee plantations, and mountains. Concepción de Ataco is known for its picturesque landscape, and its town which is full of great art and inspiration, its craft shops and cafes around town offer an unforgettable experience. next hotel in this region:. A rustic hotel inside the colonial city of Ataco, which is a city is part of Ruta Las Flores, in El Salvador. The hotel offer rooms with breakfast included, and it's located just a few meters away from Central Park in Ataco. Prices may change depending on the season. Please Contact Us further details.